ARTBOX - Dainippon Kaiga Co. Ltd. Publisher: ARTBOX - Dainippon Kaiga Co. Ltd.
Last week my loving spouse marched up to me waving a parcel postmarked from Japan she retrieved from the mail and demanded to know its contents (does this sound familiar?). An early Christmas present; “De moi, même?” After much pleading of honest ignorance, she settled down and I was able to retire and open and study its contents. Inside were two soft-cover books and business card, the first being the reviewed publication and the other a copy of the excellent magazine “Scale Aviation 11” published by the same firm.” Reviewing the magazine I discovered an excellent article on the building and painting of the Hasegawa 1/32 scale Dora-9 kit accompanied by a very detailed commentary on late-war Luftwaffe colours. The writing style was familiar and eventually I discovered the name “Michael Ullmann” buried in the article in small text. This had to be the connection. As my wife has met Michael and considers him a fine gentleman (though aware he’s a diehard “Luftie” from Luftwaffe Forschungsamt Amsterdam), my explanation that these books were review copies was eventually accepted and the matter quickly dropped. Thanks Bubi! The book, “Modeler’s Eye Series 4 – Focke-Wulf Fw 190 D Dora”, is comprised of 98 pages of colour and black and photographs, colour profiles, plans and drawings on all aspects of the subject aircraft. Technically, the book is well manufactured, being printed on a medium bond, semi-matt coated paper that offers excellent reproduction of both half tone and colour images. 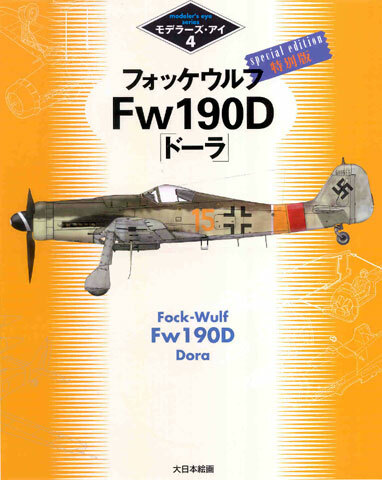 The book is laid out in a logical format, first with a Preamble on the “Lure of the Dora”, followed by a 5 page Review/Listing of all known Fw 190D model kits including thumbnail photos of all the various kit boxes and variations. The next section presents colour profiles of 18 Fw 190 Ds along with several uppersurface views. None of the subjects are new to those familiar with the Dora, with most being of well-known D-9s. The artwork’s scale appears to be a little larger than 1/48, perhaps closer to 1/40. Some old errors have crept into the artwork and I disagree with a few of the artists colour interpretations. Nevertheless, the artwork is beautifully executed and offers, in some cases, alternative camouflage colour interpretations for the modeller’s consideration. The first two sections offer a brief overview of their stated topics. The third one offers a few new photos of Doras captured by the Russians. 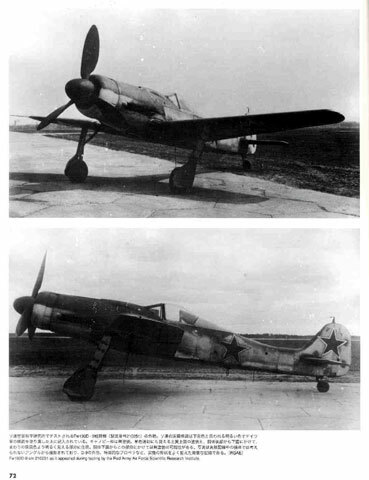 This is followed by a fascinating coverage detailing the Red Army’s evaluation of a captured Fw 190 D-9, WNr.210251. 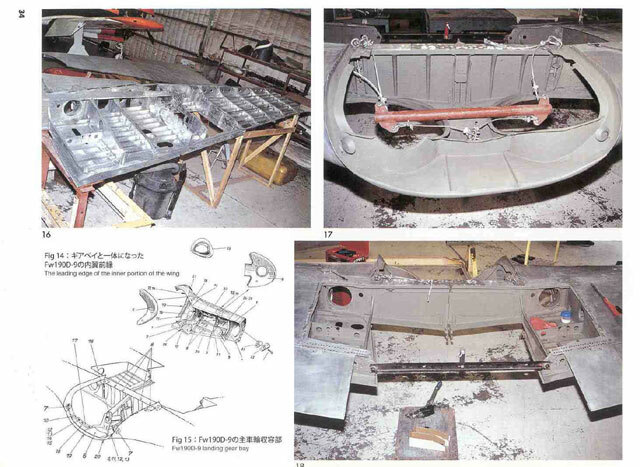 Six large photos from all angles are reproduced for the first time, as well as several detailing the Jumo 213 engine that are found in a previous section of the book. One of the photos clearly shows the remains of aircraft’s code number which appears to have been “15”, and the lack of a Gruppe marking points to a I Gruppe aircraft. The absence of a RV band, the size of the ‘15’ and its capture in the East, suggests, in my opinion, the aircraft was associated with I./JG 6. The book continues with 17 pages of beautifully detailed 1/48 scale plans, longitudinal and lateral ‘slice views’, scrap views and drawings that include useful notations on the various features, panels, access points and so forth. 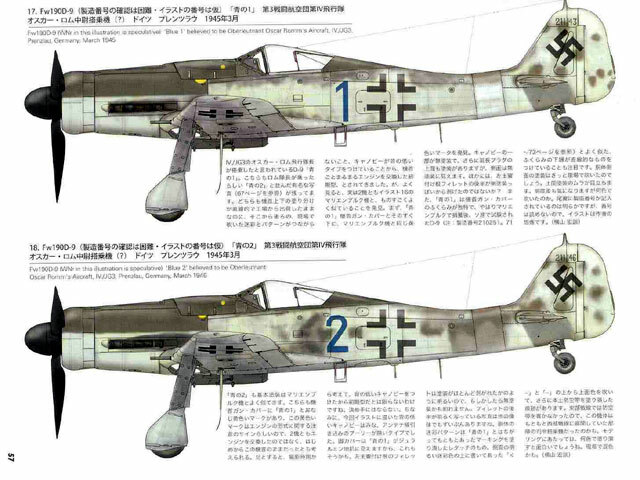 A very intriguing commentary at the end of this section discusses the length of the Fw 190 D-9, and author Kiochiro Abe makes a compelling case that the Dora was actually 11cm longer that was previously believed! Now, what would that scale-out to in 1/32? The final part of the book deals with discussion on the Jumo 213 motor. Comprehensive photographic coverage of the engine is present elsewhere in the book. In conclusion, this publication is true to the stated theme of the book series – it is designed for MODELLERS. Those wanting photographic coverage of Doras in action, detailed information on its design, production statistics, engineering and performance charts, operational histories, and the like will not find this book of particular use. On the other hand, this is the kind of book modeller’s dream about. It is highly complimentary to the older Aero Detail book that covers the same two Doras, but is concerned mostly with their external features, information on stenciling, and other topics not covered in the Modeler’s Eye book. The only weakness in this otherwise excellent book is the limited English translations. This is especially missed in the section devoted to the colour profiles. The Japanese text is extensive and obviously the artist offers his opinions on each subject’s camouflage and markings. This is a significant omission from the modeller’s standpoint since this book’s main focus is visual. It is thus recommended that the publisher strongly consider providing English translations for this part of the book in future publications in the series. As a further note, there could be a bit more attention to editing the English translations; e.g., the word Focke-Wulf” is missing the “e” on the book’s cover. Nevertheless, modellers will find this book invaluable asset to their reference library. For those who especially like to open up their subject and display various internal aspects of the aircraft, this book is a must. Many kind thanks to Ryuichi Mochizuki of ARTBOX (and Michael Ullmann) for the review sample.